The rookie NYPD officer who was critically wounded in a hatchet terror attack in Queens has returned to work after spending more than a year in rehabilitation. "It is great to be back," officer Kenneth Healey told NBC 4 New York Wednesday. Healey began desk duty at his old stationhouse this week. Healey and three other NYPD officers were on patrol on Jamaica Avenue in October 2014 when they stopped to let a freelance photographer take their photo. As the officers posed for the photo, a man named Zale Thompson charged them with an 18-inch hatchet, gashing Healey in the head and wounding Healey's partner, Joseph Meeker, in the arm. The FBI director met with NYPD officials in New York City Wednesday to discuss security, bluntly saying that ISIS onling recruiting continues to be a real problem. Jonathan Dienst reports. Two other officers shot and killed Thompson on the street, and authorities said he was still holding the hatchet when he was pronounced dead. The attack -- and the shooting -- happened in less than 10 seconds. The ax shattered Healey's skull, and the rookie officer needed numerous surgeries during his recovery. He told NBC 4 New York in an exclusive interview last May that he didn't think it was possible to get hit that hard and survive. Meeker jumped over to try to contain Healey's bleeding. "I said, 'I am going to die. I am going to die,'" Healey recalled. "He said, 'No you are not.' He kept talking to me and kept me calm ... as calm as someone can be in that situation." Healey sustained a traumatic brain injury and lost 40 percent of his vision in the attack; he said he thought at one point he was paralyzed. Healey told NBC 4 New York in May that he hoped to be back on the job when he was able. He said dealing with "lone wolf terrorists" like Thompson has become part of the job as an NYPD officer. "It's sad, but it's the world we live in right now," Healey said. Healey and his three partners targeted in the attack were honored as cops of the year in May. After the attack, Police Commissioner Bill Bratton said Thompson was a "self-radicalized" individual "self-directed in his activities." 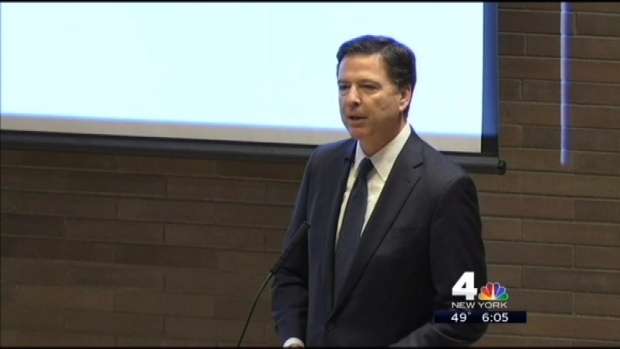 FBI Director Jim Comey referenced the attack during a visit to NYPD headquarters Wednesday, reiterating that it was a terror attack. Investigators said Thompson became radicalized by watching terror videos -- like of beheadings -- online.